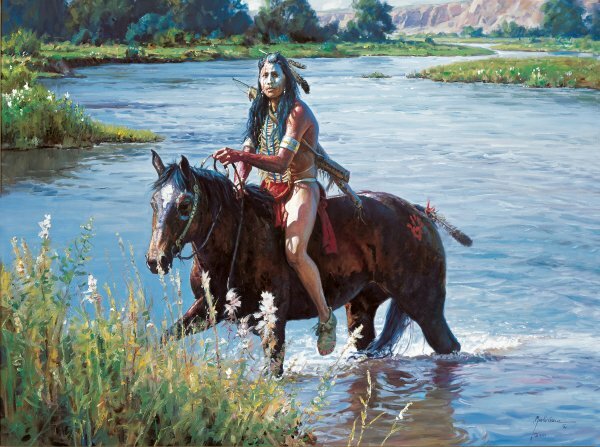 One of Grelle's favorite spots is along the Greasy Grass River and several of his paintings are placed there. This image is very dramatic with pale tones, the slow-moving river, and the flowers in the scenery. But the overall scene also belies the brave and his pony....both of whom are painted for battle. The Greasy Grass River was the site for the infamous Battle of the Little Bighorn, also known as the Battle of the Greasy Grass. With much history as one of the most fierce armed engagements between the tribes of the area and the U. S. Cavalry, we can imagine the many braves who looked the same as they prepared to do battle those many years ago.